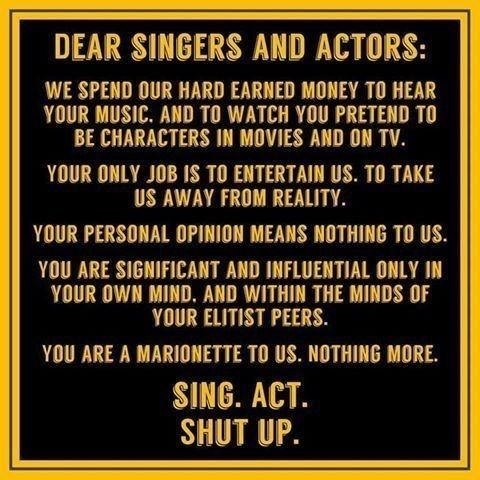 SAG and AFTRA represent these performers First Amendment and Congress did put an amendment in place to protect singers, actors and writers intellectual property rights. Many of these singers, actors and writers are highly educated people and worthy of praise and respect. Shame on the author for posting such ill-regard for them. These performers have skills that many people admire and some would love to hate. Others would love to imitate. Therefore, this is to the author of that scathing post: If those entertainers have no intrinsic value in our society, then why are they paid so well? The author is the marionette who also dances to the strings that somebody above them pulls. And therefore, if the performer has no significant value, than neither do you. You are influential only in your own delusional states of mind. Those pulling your strings know this too. So shut up and don't forget to take your meds.